How is it that Mondays are the only day I can find time to sit and write? Honestly, I don't know how real bloggers do it. I start each week with the best intentions to visit this corner every day and write and next thing I know, the week has come and gone and THAT'S WEIRD (oh wait, no it isn't), I haven't written since Monday. Try as I might, this blogging thing may not be for me. On the one hand, I feel like I put so much pressure on myself to write quality content vs quantity content. And then I can't come up with things to write about. But then it's like, why can't I just use this as a diary? Everyone else does. I also know that I'm only going to get as much out of my blog as I give, which right now is about 5%. What do I expect? To those of you who do look forward to my posts, and who comment, I want you to know I appreciate it. Stick with me for a little while longer and I hope I can make my part of the Internet something worth visiting every day. Anyway, that's about all the time I have. I've got a lot of things on my mind that are stressful and exciting and making me kind of crazy. I'll be able to fill you in soon. I understand you. I love blogging but sometimes I just cannot think of anything worthy to post and it stresses me out. 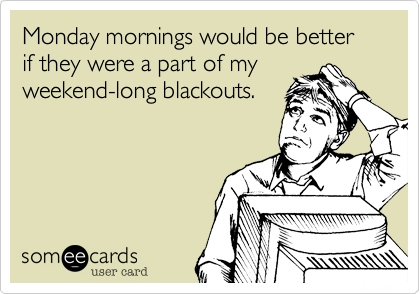 man did i have a case of the mondays yesterday! the day went by sooooooo slowly. Girl I feel you. I never make the time to write! Monday was a rough one for me, too. Hope the rest of your week was great!